19. Mug, slip-cast earthenware, 2001, H. 9cm. Virginia Graham completed a BA (Hons) in Ceramics and University of Wales Institute Cardiff and now works in the Fireworks Studios in Cardiff. Her work joins the precious and collectable with the ordinary and familiar. Virginia Graham – Mug, slip-cast earthenwareTea pots and tea services are instantly recognisable objects which were originally intended for use but by being collected acquire status. Floral transfers, metallic lustres and items such as tap handles, used out of context, remove her wares from the functional to the collectable. 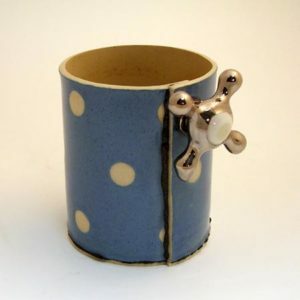 The piece uses a familiar blue and white colour and form of the popular ‘Cornish ware’ mugs but the handle is in the form of a tap and is glazed silver. The mug is not really functional.